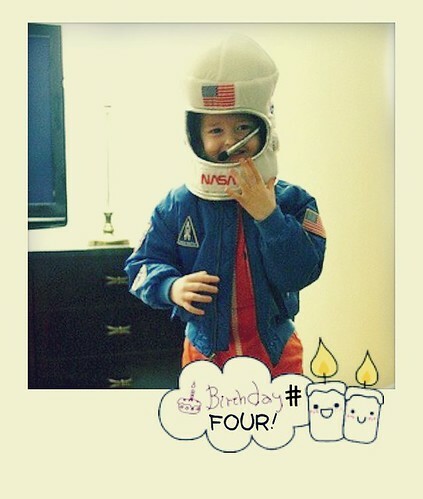 swonderland: angel troublemaker spaceman clark is FOUR YEARS OLD. angel troublemaker spaceman clark is FOUR YEARS OLD. And now I am going to tell you a Clark story that absolutely will not transfer into blog-words or make any impact when I type it out, but I am typing it out anyway. Yesterday, Alice and I were singing "Jolly Holiday" together in her room, because that is something we do. Oh it's a jolly holiday with Mary, Mary makes your heart so light, when the day is gray and ordinary, Mary makes the sun shine bright! Oh happiness is blooming all around her, the daffodils are smiling at the doves! When Mary holds your hand you feel so grand, your heart starts beating like a big brass band. As we were singing, I stopped suddenly. The baby had grabbed ahold of my hair and was pulling it, hard. The baby, who is named Harrison but who is called Hal most of the time. Harrison. Got that? "When HARRY holds your HAIR you feel so... grair, ha ha ha ha ha... WHEN HARRY HOLDS YOUR HAIR!" Okay. Like I warned, this doesn't like anything written out in words. I know that. Except that I also know I never ever in a thousand years would I have thought, "Well, the baby is pulling my mom's hair and his name is Harrison and mom sometimes calls him Harry Potter and Harry rhymes with Mary and I could say that Harry holds your HAIR instead of Mary holds your hand and it would be a funny joke!" But Clark did. Clark thought to sing it without missing a beat. Clark who is his own funny person and not me or Luke or anyone else in the world but Clark. He isn't just my baby, he is a person. This kind of crap blows my mind. Today Clark is four. Four years ago today, he was born. Four years ago today, he weighed 6 pounds 14 ounces. Four years ago I didn't know who he was, yet. Now I know, he is Clark. Happy birthday to my sweet little angel troublemaker who I could not love more. We are so glad you are Clark. Happy happy birthday, sweet Clark! That's a gem of a story. I get it. Happy BIRTHday to YOU, Mama. clark, who was almost noel, is SO like my noel. and even though you are way cooler than me, we are so much alike too. happy birthday, wise, wonderful clark! Happy, happy birthday to Clark. I totally understood this post word for word. It's so amazing to see a child's personality creep out at that age. Scary, but yet so exciting. He sounds like quite the character. I love that story. I love discovering that our little ones are actually people. Sounds weird, but totally get it. aww I totally get it! it means a lot in blog words. this is what blogging is to me. What a sweet boy, and an even sweeter story. It totally translates to the written word! I would have been in awe, too. Happy birthday, Clark! Happy Happy birthday Clark! And your story made perfect sense in the blog world. Love and cleverness have a way of transcending mediums! I ALSO did not realize that Bert was in love with Mary, and it didn't hit me until this past year when I watched it for the first time with my kids. Do you ever wish that you could go back and birth your children again, knowing them as you do now? It always seems to me like it would be even that much more amazing. happy happy birthday to the smartest kid i know. or at least, read about on the internet. and by the way? "This kind of crap blows my mind." i peed my pants a little bit. love it. i get this 100%. Happy Birthday to Clark, and to you, too, Mama. Happy, Happy Birthday, Clark!! It's just so cool how completely individual each kiddo is. It almost makes me want ten of them...you know just to see what comes out. He is awesome! Happy Birthday, Clark! I love that story. That kinda stuff blows my mind with my kids too. Happy, happy birthday sweet little Clark!! Isn't it so much fun, discovering who our dimpled darling babies turn out to be? Happy birthday to Clark! He sounds like a fun little guy. Love and miss you. Sorry for being such a bad friend lately.